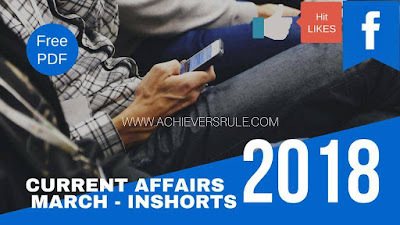 For last few days many of you are eagerly waiting for this Monthly Current Affairs Inshorts GK Capsule - March 2018. Here the PDF Version is ready to download & to easily score in Current Affairs Questions in all competitive exams. Basically these capsule will be more helpful for BANK Exams Aspirants but SSC & Railway aspirants can also use this capsule. In SSC & Railway a limited no. of questions were asked from Current Affairs but From GK you will get most questions so, here the file is ready with Static GK Note down points from which chances are very high that you will get approximately all questions from this capsule. Day by day we are trying our best to improve the quality, But due to limited time frame we are unable to give you all times. For this particular reasons sometimes our posts may hamper but be sure whatever we will share with you its purely well researched content based on our previous experience. - Banking & Other Financial Rates. - Important Days & Themes. - Important News Related to RBI, Indian Railway & Defence. - Schemes, Obituatry, Sports Related News, Venues of Imp. Summit, Newly launched Apps, Etc. Important Announcement: Those who had purchased "SPEEDY RAILWAY GENERAL SCIENCE BOOKS" from this platform are requested to wait for sometime. We will start despatching all orders from 5th APRIL 2018. Once we despatched you will get E-Mails or Calls from our end. As the printed copy is on the way, So we hope by next week we will start despatching all orders. This book will also help in Upcoming Railway ASM, Goods Guard, TC, TT, Etc. So, please give sometime to arrange everything in proper manner.